Unique and research-based, our ongoing skills monitoring will help you track progress over time in basic reading skills. With our ongoing monitoring system, you can monitor a student’s speed and accuracy progress in basic reading skills as frequently as once per week. Most other skill monitoring programs require much longer intervals between test sessions. We can do this because our test items are always sampled from a large pool of items. Consequently, no two tests are the same, and we do not have to wait until the student “forgets” the original test. 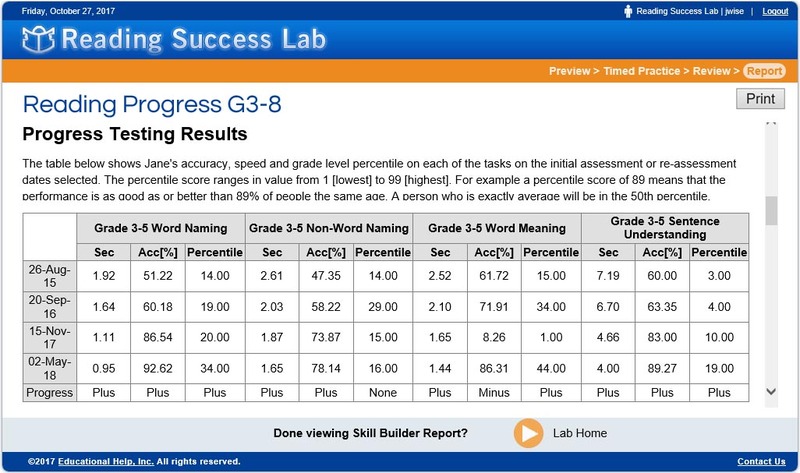 Progress reports can become part of a student’s Response to Intervention (RTI) record. One can choose to track progress in a single reading skill by selecting to perform a single skill assessment test repeatedly at intervals as frequently as once per week and graphing the results from the multiple dates performed.